Every Monday we (myself and Trout) do a 1.5 hour show on Goonbag Radio, we record and podcast that show every week. You can catch it over on the Goonbag Radio Gooncasts or subscribe via itunes. 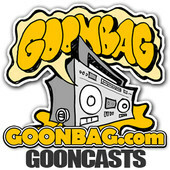 You can catch us broadcasting live every Monday from 6:30 AWST and 8:30 AEST on the live channel on Goonbag Radio. In this podcast we’re joined by Ellesquire from Big Village Records to have a chat and Rae from Perth to chat about the recent Beat Down 5 producer battle. Gooncast post with the show and direct link.